The first edition of the New York Post under publisher Dorothy Schiff (March 11, 1903 - August 30, 1989) which changed the printing format from a broadsheet like the New York Times to a tabloid. Published in the afternoon, the Post competed with many other papers like the Herald Tribune, Evening Sun, and Journal American, which had larger circulations but only the Post survived. Schiff and her editor (later husband) Theodore O. Thackrey, revamped the paper into a liberal bastion that supported President Roosevelt and the Democrats. She told the New York Times, "We are anti-Nazi and anti-Fascist. This is obvious." This first issue headlines the previous night's Royal Air Force raids. 211 of 263 aircraft, 179 Vickers Wellingtons, forty-four Handley Page Hampdens, twenty-nine Short Stirlings, and eleven Avro Manchesters attacked Cologne, losing four Wellingtons and one Hampden in attacking the Humboldt Works at Kalk, a center for manufacturing heavy industrial machinery, fittings, and locomotives. Results could not be verified. The Germans reported just one building hit and twenty-three killed, including sixteen who were caught when a crashed bomber's payload exploded in downtown Cologne. Thirty-nine were injured. In Paris the same night, fourteen of twenty Armstrong Whitworth Whitleys attacked the Gnome and Rhone engine factory in the outskirts of Gennevilliers. No aircraft were lost, no civilian casualties, and no damage to the plant. Four residences were destroyed and one damaged. 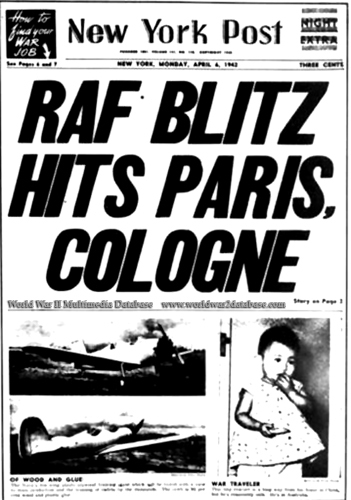 Using the term "RAF Blitz Hits Paris, Cologne" was typical of the new focus the Post had as a tabloid, sensationalizing the war news. Schiff sold the Post to Rupert Murdoch in 1976 for $30 million.